House speaker Jose Oliva, R-Miami Lakes, pounds the gavel to start the first day of the legislative session Tuesday, March 5, 2019, in Tallahassee, Fla.
Florida House Speaker Jose Oliva on Tuesday made his case during an address on the opening day of the legislative session, urging the House to pursue a fiscally conservative agenda by tackling rising health-care costs and “great excesses” in the state university system. 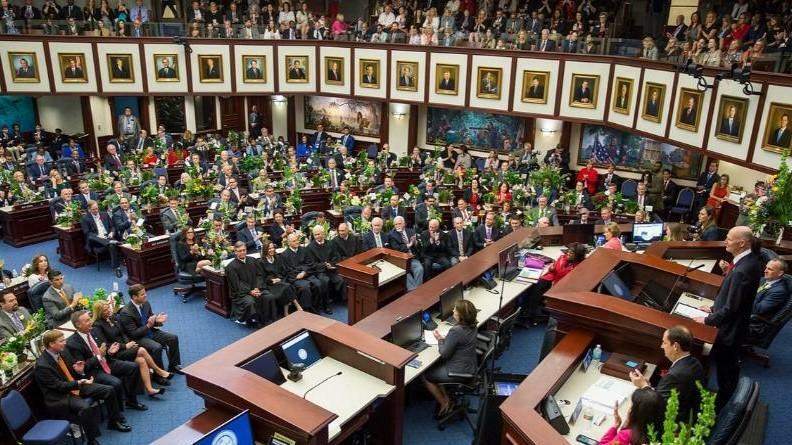 Oliva said a budget proposal the Florida House will craft for the upcoming fiscal year will be aligned to priorities, including reform in health care and higher education. In his speech, Oliva also took aim at hospitals, which he referred to as “health-care industrial complexes” and pharmaceutical companies for gouging customers. After railing about the health-care system, Oliva also flagged concern with the state university system and told lawmakers a crackdown on higher-education spending is needed. That stems from concerns about financial scandals that have involved three public universities in the last year. Most notably, it has involved a financial controversy swirling at the University of Central Florida, which is under investigation by the House for misusing more than $38 million for a building project, the Trevor Colbourn Hall. “With our sincere accolades must come the concession that there have been great excesses within the system and a propensity to fill the campuses, build new buildings and grow higher and higher paid administrative staff,” Oliva said. Oliva said he will seek to adjust how universities receive funding, including how universities request state funds to construct new buildings. If a university wants a new building, Oliva said, he wants it to provide a space-utilization study to justify that need. “Every building will require a down payment as well as an escrow account to ensure for its future maintenance,” Oliva said. A policy outline for the K-12 system was not detailed by Oliva, but he said he was supportive of expanding school choice, something Gov. Ron DeSantis and the Florida Senate are prioritizing. But it remains to be seen how the House and Senate will agree on Oliva’s priorities, specifically on health care, which will gobble up $37.1 billion in state and federal dollars this year and accounts for nearly 42 percent of the overall budget. State economists estimate that it will cost $28.1 billion to keep Medicaid at current levels for the upcoming 2019-20 fiscal year. That means lawmakers would need to come up with $164.2 million more in state money than what they currently are spending if they want to avoid cutting programs. Included in those state estimates is the assumption that the Legislature will continue a controversial $98 million reduction it made last year. DeSantis included the cut in his proposed $91.3 billion state budget, and the Senate also has taken steps to continue it. The House and Senate are both expected to take a close look at hospital funding and how much the state spends and how dollars are allocated. Last year, the Senate proposed changing how Medicaid payments were distributed to hospitals, but the House resisted. Industry lobbyists expect the issue to resurface this session. At the end of his speech, Oliva gave a nod to DeSantis’ priorities. Oliva, who was one of the first state lawmakers to endorse DeSantis for governor, supported increasing teacher pay, giving assistance to the hurricane-damaged Panhandle and considering funding for the governor’s $625 million environmental platform.